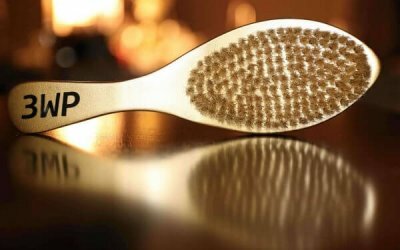 As you should know, brushing is the key component to getting the best waves. The more you brush the faster your waves will come in. 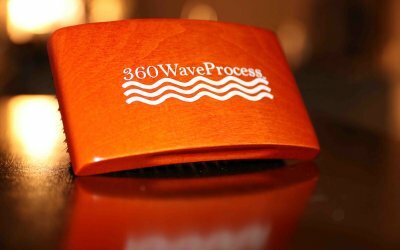 There are many different wave brushes available today and this page will help teach you about a select few. It also will shed some light on which brush you should probably use if you’re a beginner. Here is a list of my favorite brushes. A picture and a short description detailing why I like each brush. You should notice how all of these are medium 360 wave brushes except for the Gold edition. If you seen my, “How to get 360 waves with a medium brush” YouTube video, then you know that I think medium brushes are the best because you can use them when your hair is low on a fresh-cut and when your hair is high, while you’re wolfing. 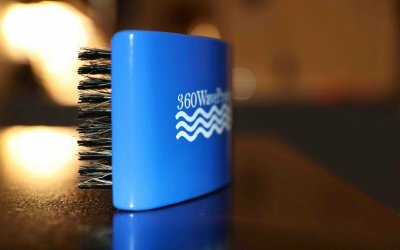 The 360WaveProcess blue edition brush, also known as the 3WP brush, is made from a high quality soft wood and finished with a glossy light navy blue colorway. 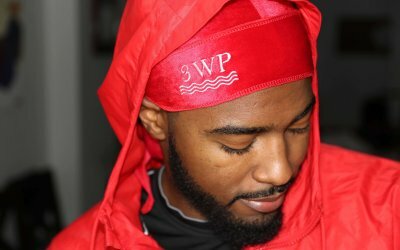 The 3WP Wave Logo on the back is wear resistant, so you do not have to worry about the logo smearing off after normal regular use. 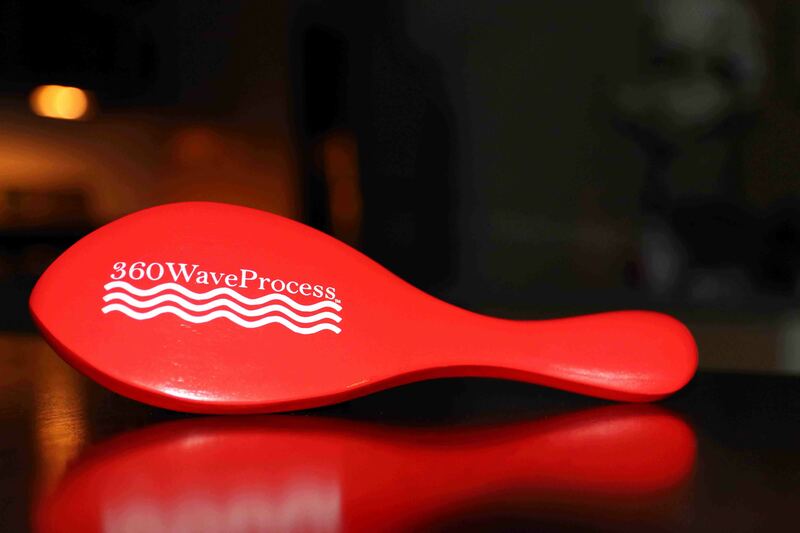 From the 3WP Wave logo, to the designed curve, it was crafted with the 360 waver in mind. This model is a Medium with a boar bristle, nylon mix that gives it a unique feel. It is best described as a medium bristle brush with the pull of a hard brush. It has a curved design that enables it to come in contact with more hair during each brush stroke. This curved design feature allows for faster results since each stroke you make comes into contact with more hair when compared to a regular straight brush. 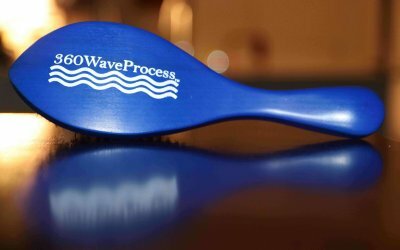 The 3WP Wave Logo printed on the brush is wear resistant. 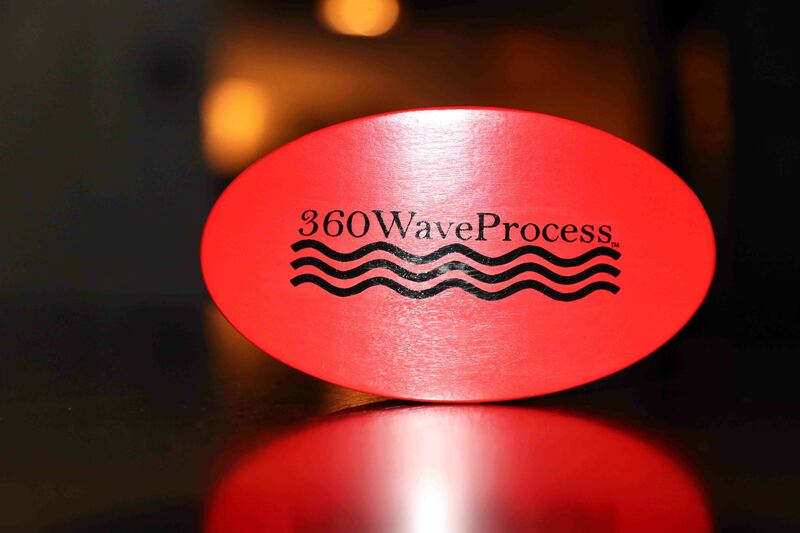 The logo also acts as a guide for developing perfect 360 Waves. While mirror brushing, simply use the wave logo on the back of the brush as a guide. 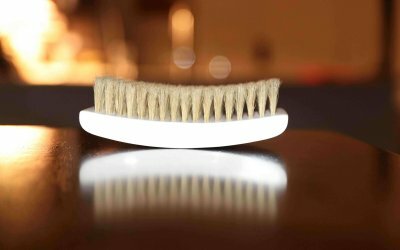 When you are brushing, simply tilt the wave logo at the angle you want your waves to come out and you will avoid forks while keeping consistent brushing angles. This brush is only available for purchase here, directly on 360waveprocess.com. 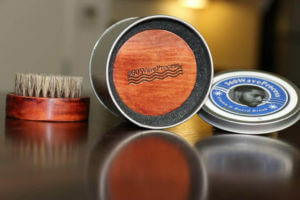 The 360WaveProcess Crown and Beard Brush is the ultimate travel brush. It is a diverse tool and is great for grooming facial hair as well as getting precise angles when brushing the 360 waves crown area. Perfect for a waver who has an eye for detail and would like to develop a beehive or swirl crown. The 3WP Crown brush fits snugly into the palm of ones hand. It also conveniently fits into the front pocket without causing an uncomfortable bulk which make it the ultimate travel brush. A pocket brush in other words used for quick easy brush session on the go. Order yours today by visiting the product page here. The 3WP Gold Edition is like no other brush I’ve used. It can be easily identified by its beautiful gold and black colorway. It is different from the 3WP Brush Blue Edition in a few key ways. The first major difference is in the bristles. 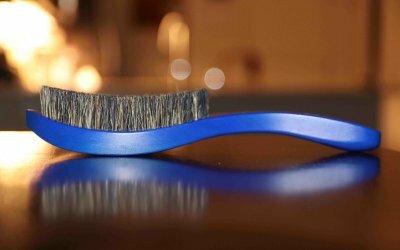 The blue edition is a mixed boar bristle brush which gives it a much different feel when compared to the Gold Edition. The 3WP Gold Edition is a premium 100% boar bristle brush making it softer and more smooth than the bristle mix of the blue edition. This is perfect for a waver who loves to brush with low haircuts, or has already developed a deep wave pattern. The Gold Edition has an overall much smoother feel when compared to the Blue Edition. 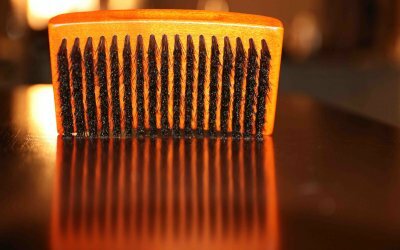 The bristles are soft however, they are firm enough to lay down the top-level of hair even when wolfing. The premium soft golden boar bristles are designed to add a natural shine and luster to the hair. 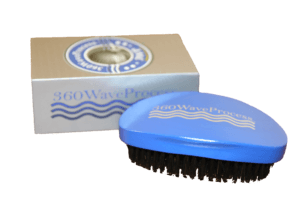 This brush is actually recommended for wavers who have already developed a wave pattern in their hair. 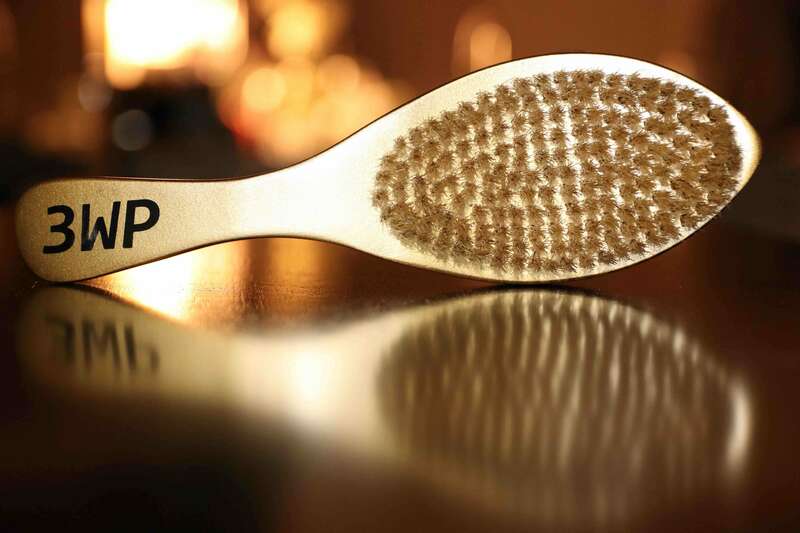 Beginners can use the gold edition, but it should be limited to use on low cuts since the bristles are softer and less effective at pulling the hair at higher lengths. The Gold Edition is most effective at brushing the waves when the hair is at lower lengths. It is recommended that beginners use a medium brush to build their wave pattern and once the pattern comes in, it will be good to begin using a soft brush such as the gold edition as a finisher brush to put the final touches after a fresh haircut or wolf session. The 3WP brush red edition with the handle is one of the best brushes that a waver can have in their brush arsenal. It is equipped with firm medium boar bristles that gives it the firmness of a hard brush while still having the smooth feel of a medium brush. It’s firm boar bristle mix makes it excellent at laying down a heavy wolf. Although it has firm bristles it is not to be confused with the hard bristles that the regular no handle 3WP red edition is equipped with. These two brushes contain two different sets of bristles and they have two completely different feels. Most people will find the bristles of the handle red edition are smooth enough to use during low cuts. The no handle red edition on the other hand, with its reinforced hard bristles will be considered too hard to use on low cuts by people who have tender scalps. It is suggested to use the hard brush during wolfing stages. This is the hardest brush in the 3WP line up. It contains reinforced boar bristles and it has a great amount of pull due to the firmness. This is the perfect brush for anyone who feel like they have tough hair. Please note that it is a true hard brush and it may be too firm to use with a low haircut. If your hair grows thick, quickly you will find yourself reaching for this hard brush right here. If you like your brushes firm, but not too hard then I suggest going with the red edition with the handle as it has strong boar bristles but they are not reinforced so it has a much smoother feel and can be comfortably used during fresh cuts and when wolfing. 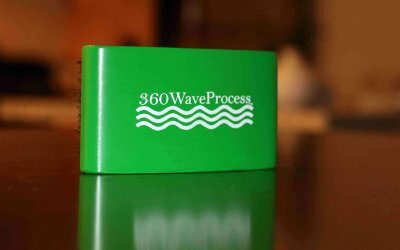 Need help with your waves? 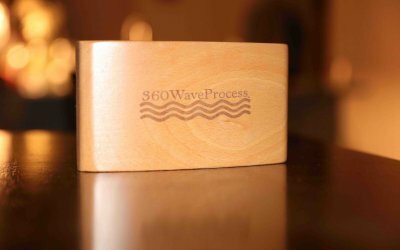 Check out this page about How To Get 360 Waves on the TOP : The best waving tips from 3wp. 3WP Fiery Orange Edition (Medium). 3WP Snow White Edition (Softy). 3WP Wood Grain Edition (Hard). 3WP Cool Dark Blue (Hard). Blue Edition with Handle (Hard).